Coupon Rate is the interest rate that is paid on a bond/fixed income security. It is stated as a percentage of the face value of the bond when the bond is issued and continues to be the same until it reaches maturity. 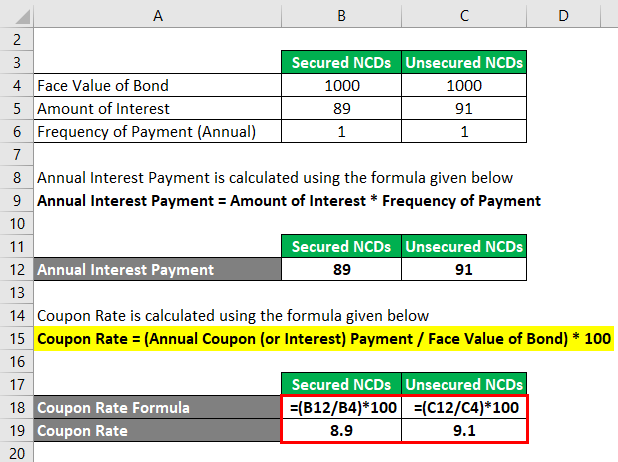 Once fixed at the issue date, coupon rate of bond remain unchanged till the tenure of the bond and the holder of the bond gets the fixed value of interest at fixed predetermined time intervals. 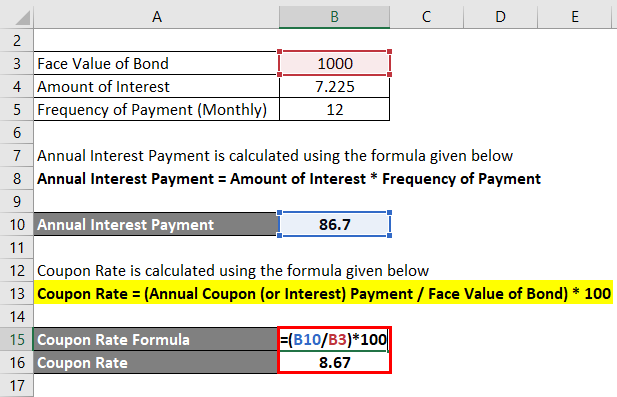 Coupon Rate is calculated by dividing Annual Coupon Payment by Face Value of Bond, the result is expressed in percentage form. Step 1: In the first step, the amount required to be raised through bonds is decided by the company, then based on the target investors (i.e. retail or institutional or both) and other parameters face value or par value is determined as a result of which, we get to know the number of bonds that will be issued. 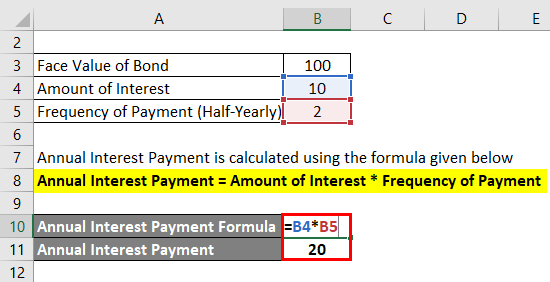 Step 2: In the second step, firstly amount of interest and frequency of payment is decided, and the total annual interest payment is calculated by multiplying the amount of interest with the frequency of payment. Step 3: In the final step, the amount of interest paid yearly is divided by the face value of a bond in order to calculate the coupon rate. 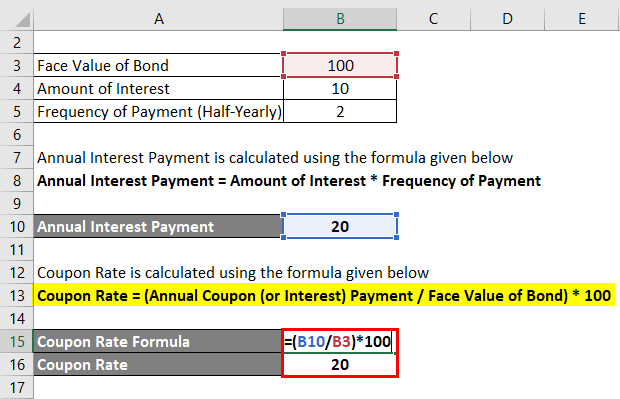 Let’s take an example to understand the calculation of the Coupon Rate formula in a better manner. Company ABC issued a bond of Rs. 100 Face Value and Rs. 10 as half-yearly interest. Now, if the market rate of interest is lower than 20% than the bond will be traded at a premium as this bond gives more value to the investors compared to other fixed income securities. However, if the market rate of interest is higher than 20%, then the bond will be traded at discount. As we know, an investor expects a higher return for investing in a higher risk asset. 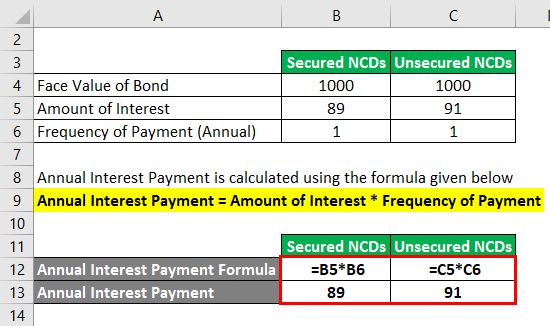 Hence, as we could witness in the above example, unsecured NCD of Tata Capital fetches higher return compared to secured NCD. 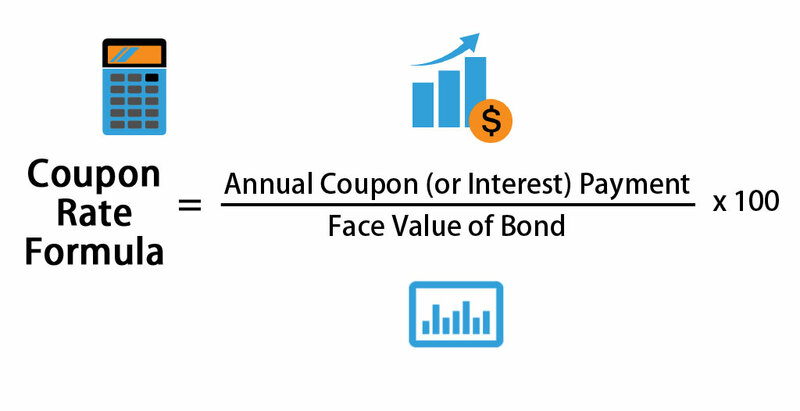 Coupon Rate of a bond is determined after considering various factors, but two of the key factors are interest rates of different fixed income security available in market at the time of issue of bond and creditworthiness of the company. The coupon rate of a bond is determined in a manner so that it remains competitive with other available fixed income securities. However, the coupon rate of newly issued fixed income securities may increase or decrease during the tenure of a bond based on market conditions, which results in the change in the market value of a bond. Market Value of a bond is a derivation of difference in coupon rate of bond and market interest rate of other fixed income securities. If interest rate of a bond is below the market interest rate, the bond is said to be traded at discount, while if the interest rate of bond is higher than market interest rate, the bond is said to be traded at premium and similarly, a bond is said to be traded at par if interest rate of bond is equal to market interest rate. The coupon rate is also depended on the creditworthiness of the company. Companies need to undertake credit rating of the bond from a credit rating agency before issuing of the bond. Credit rating agencies assign a credit rating to the bond issue after assessing the issuer on various parameters riskiness of the business in which company operates, financial stability, legal history, default history, ability to repay money borrowed through bond etc. Credit Rating hierarchy starts from AAA and goes up to D, with ‘AAA’ being most safe and ‘D’ being Default. Generally, bonds with a credit rating of ‘BBB-and above are considered investment grade. Higher the rating of a bond means higher safety and hence lower coupon rate and vice versa. Coupon Rate Formula helps in calculating and comparing the coupon rate of differently fixed income securities and helps to choose the best as per the requirement of an investor. It also helps in assessing the cycle of interest rate and expected market value of a bond, for eg. If market interest rates are declining, the market value of bonds with higher interest rates will increase, resulting in higher yield and hence higher return on investment and vice versa in increasing market interest rate scenario.